Long Jing has been one of the most famous teas in China for a long time. This marvelous tea has been described in Lu Yu's Cha Ching (The Classic of Tea) as the four perfections - perfect color, taste, fragrance and shape. During the Qing Dynasty, Emperor Kang Xi was known to travel from the Forbidden City just to get a taste of the freshest Long Jing. This emperor grade Long Jing is made using very fine, first flush tea leaves. 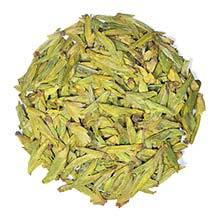 Emperor Long Jing has a soothing aroma and flavor. The taste is smooth, delicate and highly refreshing with a sweet floral aftertaste. Fresh green and evenly sized, flat tea leaves. One bud, one to two leaves variety.